We have compiled a list of the most frequent questions regarding your ophthalmologist appointment. If we haven’t covered your question here, do not hesitate to contact us. What should I do in case of ophthalmology emergency? During clinic hours you can call reception on 0362888188; or after hours contact the Royal Hobart Hospital and ask to speak with the on-call ophthalmologist. If you have recently had surgery with one of our doctors they will have given you a mobile contact number to call. What are the ophthalmology clinic opening hours? Other than on public holidays. Do I need a referral for my ophthalmologist appointment? We will need a current and valid referral from either your GP or optometrist either prior to or on the day of consultation. It ensures that your ophthalmologist is informed of your medical health by your referring provider. We will endeavour to notify you if your referral has expired but it is your responsibility to ensure that it is current. Referring providers are unable to back date referrals and without a current referral Medicare will not refund your account at the specialist rate. What will happen when I arrive for my first ophthalmologist appointment? 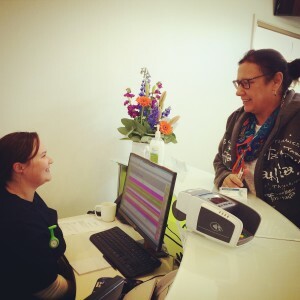 You will be greeted by our friendly reception staff who will confirm your personal details and request your current Medicare, Pension and/or private health insurance card. They will also confirm that your referral is valid. Our ophthalmic assistants will then complete a medical history and perform preliminary tests before seeing the doctor. How long will a ophthalmologist appointment take? Please allow 1-2 hours for your consultation. Extra time maybe required for diagnostic tests and minor procedures to be performed on the day. At Precision Eye Clinic our doctors endeavour to run as close to appointment times as possible. However, in the event of an emergency there maybe unavoidable delays. We recommend you have a driver/carer with you as your vision maybe blurred from dilating drops. You may also be affected by glare. Sunglasses will help alleviate this. Yes there is at the rear of the building. It can be accessed via the lane way to the right of the building. Will I be required to pay for my ophthalmologist appointment on the day? Yes, an account will be issued on the day of your visit and it is expected that all accounts (other than surgery) will be settled on the day of consultation. We encourage all patients to register with Medicare for the Safety Net program to ensure they can obtain maximum rebate once they have reached the Safety Net threshold. Note that we participate in Electronic Medicare claiming. What happens if I can't or don't attend my ophthalmologist appointment? If you are unable to attend please let us know at your earliest convenience so that we can reschedule your appointment. As our appointment are in high demand it also allows us to offer it to another patient. If you do not attend your appointments without notice you may need a new referral for ongoing care.